Sun Colony At Summerlin - Attractive 'Corner' Property W/ Cascading Water Feature, Fully Fenced Rear, B/I Bbq, Mountain Views, '5130' Model Boasts Of Approx 1621/Sf, 2 Bed, 2 Bath, Open Great Rm W/ Dining Area, Kitchen W/ Stainless Steel Appliances, Glass Backsplash, Light Wood Cabinetry, Solid Surface Counters, Receipe Windows, Laundry Rm W/ Sink & Cabs, Tile, Lam/Wood Floors, Fans, Pleated Shades, Cov Patio, Lg Deck, 2 Car Garage W/ Epoxy Floors & Storage, Plus More! MLS#2085777. Award Realty. 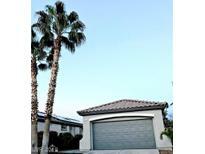 Summerlin Village - Private backyard has covered patio, stamped concrete & BBQ stub. MLS#2085795. Realty ONE Group, Inc.
Pinedale At Summerlin - Featuring An Open And Inviting Floor Plan W/ Upgraded 2-tone Paint, Flooring And Fixtures Throughout, An Entertainment Loft W/ Mountain Views, Solar Panels For Low-e Costs And A Large Backyard That's Ready For Entertaining! MLS#2085958. Orange Realty Group LLC. Willow Glen At Summerlin - Walking distance from Willows Park Community Center w/Waterslide & Pool, Clubhouse, Basketball Courts, Walking Trails & up the street from Downtown Summerlin, Shopping, New Baseball Stadium, Restaurants, and much more. MLS#2086124. Petra Realty Group. Pinecrest At Summerlin - *fully Upgraded*4 Large Bedrooms*2.5 Baths*1/2 Bath Down*stainless Steel Appliances*eat-in Kitchen*granite Counter Tops*huge Family Room*master Bedroom Separate From Other Bedrooms*2 Car Garage*new 2" Blinds Through Out*tile & New Carpet*no Carpet Down*desert Landscaping Both Front And Back*dog Park On The Street*very Low Hoa Pmt*close To Shopping*215 Freeway*new Raider Stadium*airport*call Now! ! MLS#2085800. Simply Vegas. 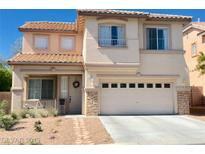 Summerlin Village - There is still time to personalize the interior of this home and make it your own MLS#2085720. Xpand Realty & Property Manage. Sun Colony At Summerlin - Fabulous 'Golf' & Mountain Views, Custom Iron Gated Lg Courtyard, Stamped Concrete W/ Pavers, Glass Entry Door, '7120' W/ Approx 2309/Sf, 3 Bed, 3 Bath, Enclosed Den, Dining Rm, Open Great Rm, Kitchen W/ Granite Counters/Backsplash, Stainless Steel Appliances, Custom Cherry Cabinetry, Skylights, Fans, Shutters, Wood Flooring, Tile, Coffered Ceilings, Alarm, Lush Landscaping, Cov Patio, Trellis, 3 Car Garage W/ Metal/Glass Side Door, Plus More! MLS#2085531. Award Realty. Sun Colony At Summerlin - Great Location & Property In & Out, Curb Appeal, Cultured Stone, Pebble Drive & Walkway, Gated Entry, '6150' Model, Approx 2288/Sf, 3 Bed, 2 Bath, Den, Lg Open Great Rm W/ Dining & Nook Areas, Kitchen W/ Granite Counters & Tile Backsplash, Maple Cabinetry, Stainless Steel Appliances, R/O, Laundry & Hobby Rooms, Porcelain Tile, Lam/Wood Floors, Crown Molding, Bay Windows, Alarm, New Paint T/O, Shutters, Fans, Awnings, 2 Car Garage, Plus More! MLS#2085527. Award Realty. Summerlin Village - Kitchen is immaculate with granite counters and custom finishes throughout. NO SID! Paid OFF! MLS#2085745. Weichert Realtors-Millennium. Madison Place At Summerlin - Master bath has dual vanities, separate tub & shower. Backyard has patio. MLS#2085622. GK Properties. Cypress In The Hills - Upgraded flooring, granite countertops, stainless steel appliances, designer lighting and fixtures. Move in ready! MUST SEE! MLS#2085689. 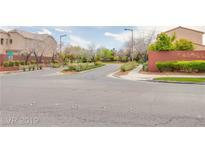 Realty ONE Group, Inc.
Paradise Canyon - No neighbors behind you, just a beautiful park. MLS#2085594. The Tom Love Group LLC. Not all homes in this community have fully fenced in backyards but this one does! ! MLS#2085520. Signature Real Estate Group. 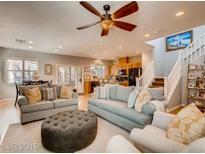 Red Rock Country Club - Updated to an open floorplan by removal of walls off kitchen. MLS#2083327. Allison James Estates & Homes. 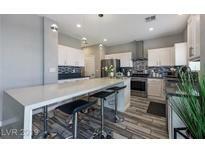 Summerlin Village - __OPEN HOUSE THURS-FRI 04/18, 04/19 10:00-3:00PM__Barely lived in Contemporary beauty nestled near the mountains of Red Rock National Park*54k backyard*20k 7 stage H2O system*Hunter Douglas and Norman shades*Zen inspired courtyard & backyard with modern fireplace*waterfalls and fountain*Gourmet kitchen*Cotton white granite counter tops*Stainless Steel Monogram & Electrolux appliances*2 masters, one downstairs*Walking distance from Bishop Gorman MLS#2085481. Keller Williams Southern Nevada. Palomar At The Paseos - Wired for home security and satellite TV. Large three car garage. MLS#2085339. Continental Real Estate Group. Sun City Las Vegas - Community has 5 Pools/Spas & Activity Centers. MLS#2085154. Urban Nest Realty. La Mirada Summerlin - Fantastic Summerlin location near natural Pueblo Arroyo path, Tivoli, Rampart Commons, TPC, & Sumrln Pkwy. MLS#2084638. Desert Sky Realty. Springfield At Summerlin - What a GREAT home*lovely gated entry walkway*VERY open living/dining*fireplace*stone flrs*uprded granite & stainless steel appliances in kitchen*master down w/spa like master bath & large w/in closet*large den*loft*great sized secondary rms*VIEWS*wonderful entertainers back yard w/built in BBQ, gas fire pit*water feature*beautiful hardscape*backs onto park creates very expansive feel*LOCATION is awesome*stones throw to Downtown Summerlin*MUST SEE MLS#2085251. RE/MAX Advantage. Willow Springs At Summerlin - Great Back Patio With Mature Landscaping. MLS#2084135. Realty ONE Group, Inc.
Echo Ridge At The Ridges - All Single Story Homes By Community Park And Summerlin Attractions-courtyard Entrance, Formal Dining Room, Kitchen W/Granite, Pull Outs And Breakfast Bar Open To Great Room Leading To Covered Patio And Bi Bbq-private Spacious Backyard W/Heated Pool & Spa, Sun Deck-solar Tube Lights In Laundry And Guest Bath-plantation Shutters T/O-master Bedroom W/Retreat-extra Deep 2 Car Garage W/Storage Cabinets And Workbench-corner Lot MLS#2085041. Simply Vegas. Westpark Summerlin Village - This is Summerlin living at its best! MLS#2085474. Realty ONE Group, Inc.
Sun City Summerlin - Resort-Style Living in the heart of Summerlin ! MLS#2084975. Keller Williams Market Place I. Sun City Las Vegas - Backyard Paradise w/2 sitting areas! WOW! MLS#2084465. BHHS Nevada Properties. Evergreen In The Hills - I see , you see, all come see! MLS#2085319. Source Realty.